Dunlop Aerogel 4D Rackets - any 2 for $159: SAVE $40! 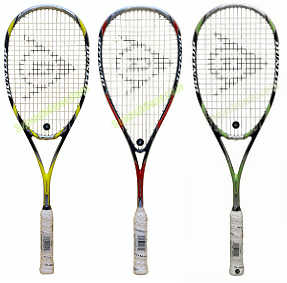 | Dunlop Aerogel 4D Rackets - any 2 for $159: SAVE $40! Yes, SALE on clearance items! $99.99 each if you buy one frame. Save 20% or $40 when you buy 2 frames. 3 fantastic frames for choose from. Light, well balanced powerplants, these models have been a choice of World Touring Pros - Amr Shabana, Nick Matthew, Gregory Gaultier - in the previous seasons.